Art That Changed the World tells the story of every major art style, movement by movement, giving art lovers a visual timeline showing key paintings that sparked each transition and explaining major events that shaped their evolution. 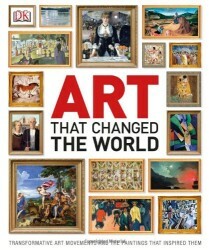 Each section features a lavish double-page image of an influential painting that defines each artistic style. Seminal works of genius are portrayed in their historical context, with attention paid to the culture of the time and the lives of their creators.